A mother explains to her young daughter why the girl's father is in prison and what his life is like as an inmate. 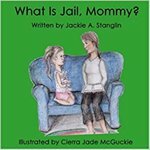 Stanglin, Jackie A., "What is Jail, Mommy?" (2006). DIVerse Families. 954.